Roma has been the talk of this year’s festival circuit, from the ones in Toronto and Venice to the New York Film Festival last week. It’s also quite literally the talk of Colonia Roma, Mexico City, the district in which the movie is set. Alfonso Cuarón’s latest project—his first in five years, following its Academy Award-winning predecessor, Gravity—is the director’s most intimate work yet. 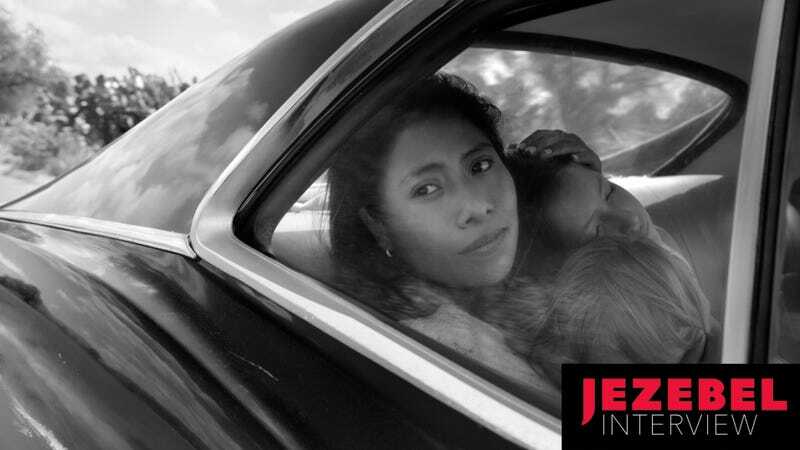 A semi-autobiography, built almost entirely on memory—Cuarón’s, and those of his nanny (and second mother figure) at the time, Libo (Cleo, in the film)—Roma is a deeply personal look at the struggles of women in a middle-class family in Roma, Mexico City, during 1971, a time of heightened political unrest. For Cuarón, the film was about coming “to terms with the elements that forged” him, he told the audience in Toronto. For the viewer, it’s about recognizing that “existence is nothing but a shared experience of loneliness,” he said later at the New York screening. The film, fittingly, rolls out like a string of vivid recollections, shot in 65mm black-and-white. The actors seem as equally taken aback by the events unfolding on screen as the viewer—an intentional choice on Cuarón’s part. He and executive producer David Linde were the only ones who read the script throughout the six-month filming process. The actors never held a physical copy and were only made aware of scenes and plot advances on the day of shooting. So when Aparicio’s character had to dive into a roaring ocean to save two children and later give birth in the movie, she says the process felt visceral as a first-time actor. Aparicio, a 24-year-old pre-school teacher from Heroica Ciudad de Tlaxiaco de Oaxaca, plays the role of Cleo. Two years ago, at 22, she put her life on pause, learned Mixteco, and helped tell the story of the woman who helped raise Cuarón and his siblings while her own life was being put through the wringer. We met on a Sunday at Essex House to talk about what it was like to have Roma be her first acting experience, her thoughts on the film being labeled as feminist, and what cultural aspects of early 1970s Mexico remain the same. Our conversation has been translated from Spanish and lightly edited for clarity. JEZEBEL: When and how did you meet Alfonso Cuarón, and how did he convince you to play the role of Cleo? YALITZA APARICIO: I met him in Mexico City on the penultimate day of castings. We were told that the movie would be shot in Mexico, but they never said who the director would be—which, honestly, wouldn’t have helped because I didn’t know who he was. I looked him up and I still didn’t think it was him because he’s so much skinnier now! In fact, I was hesitant to go to the casting because I thought it could’ve been a trafficking scam. My family feared I wouldn’t come back, so my mom came with me. After the final casting, I met Marina De Tavira, and Cuarón asked us if we had time to work on his movie. I laughed and said, “Well, I’m not doing anything, and I need the job.” I had just finished college. Plus, the first time I met him, he was so amicable and made everyone around him feel like a longtime friend. So that security of knowing he was a good person convinced me as well. He then told me, ‘Now, you’re going to discover how her story unfolds.’ I lived it as if it was my life. And how did he explain the film’s synopsis and plot line to you without a physical script? He simply told me it was a very personal story. He said, “It’s my life. I’m going to take a risk to make it and we’ll see how it comes out.” There was no script. He told me, “We’re going to tell Libo’s story.” Libo and Cleo are one and the same. He then told me everything he knew about Libo’s story prior to where the film kicks off—where she came from, her origins, how she arrived at his house when he was a child, and her relationship with her family. He then told me, “Now, you’re going to discover how her story unfolds.” I lived it as if it was my life. I was. Plus, everyone called me Cleo because it’s so much easier to say than my actual name [laughs]. I submerged myself in her character as if it was my own. Did you meet the actual Libo? Were you able to spend time with her before embarking on this project? Yeah, I was able to visit her in her home and when I saw her my first thought was. We look nothing alike! Libo laughed and said, “Yes, we do. When I was younger we looked very much alike.” She’s a beautiful person. I just kept thinking, I don’t know if I could honor her story well. It’s a challenging task to represent someone else. But seeing her, and getting to know her made me realize we actually have similar ways of thinking, and a deep commitment to our families. What did she tell you after seeing the film? I had the chance to talk to her just a few days ago and she congratulated me. She said it was as if she was looking at an image of herself. I’ve always said that, to me, she is my greatest critic and judge because only she knew if thinking actually played out the way they were depicted. She liked it! I imagine that was a huge relief for you. Is there a part of Cleo’s story which you identify with, or see other women in your life reflected? During my youth, and time as a student, I was a domestic worker. So I had an idea of how things are. Every time you work at a new home, particularly when there are children involved, and you’re left to care for them—it feels as if they are your own. There’s nothing more difficult than leaving them. Plus, my mom is a domestic worker as well. So seeing the film, I was reminded of her. Since it is a film that plays with memories and pulls at your own memories and emotions, everyone can get something different from it. When it comes to the film, Cuarón mentioned that the interpretation is objective and up to the beholder. For you, what is the key message of the film? Alfonso is right in this case. Since it is a film that plays with memories and pulls at your own memories and emotions, everyone can get something different from it. For me, it’s about being human. It’s about life. It’s about not seeing social class, gender, race, culture—we’re all human. Many people say the film is feminist, or implies that men are all machistas, and the film does perhaps lend itself to that—and it’s sometimes true—but at the end of the day, it’s about re-thinking and realizing that we’re all the same and that we have to support one another. You’re right in that there’s a feminist undertone at times—albeit unintentional. Would you label this film as feminist? Well, no. It gives us a look at the work and responsibilities that women have to handle and shows how they defend each other to move forward. It’s about that union between women, especially when you have something in common—in this case, the love of family. I wouldn’t want people to think that women are more important than men or that men are more important than women, because I have met men who raise their children on their own. And so, this is more about family—whether you’re a man or a women, most people would give everything and anything for their families. It’s true that often times men remove themselves from the picture, but it doesn’t have to be that way. There’s a lot of raw emotion in a few of the scenes. Which was the most moving, and which was the most difficult, for you? To act out or to see? Watching the scene in which the father leaves was really difficult. How nonchalant and cheerful, no? As if he was going off to vacation. And, in terms of acting it out, the birth scene was the most moving. I had no idea how it would end and once it was over, Alfonso came over and we were all crying. I couldn’t control myself. Apart from that, getting into the ocean was the most difficult. The children and Alfonso all said that it wasn’t deep, but I’m not used to it—there is no body of water near where I live—so I was terrified. They’d asked me before, and even though I don’t know how to swim, I said I could hold my breath. There were scuba divers and security around but once we started filming, they all hid. In that moment, I understood clearly what a mother’s instinct is like—no matter what, you’re going to get your kids out. Even if you can’t swim, you’re going for them. This particular role, and the way it was filmed, sounds like a once-in-a-lifetime experience. Even though this wasn’t your plan in life, are you now motivated to continue acting? Well, I was told not to think about it anymore. Many people are just telling me to enjoy the moment. Perhaps it will repeat itself, perhaps not. But I’m just living it and enjoying every moment, and then we’ll see. Because now I have two careers I really like. Of course, making a movie doesn’t skew that far from educating—it’s a form of sharing a message. If I do continue acting, though, I’ll have to study so I’m more educated on the subject. So we’ll see. I’m just enjoying this moment for now. Speaking of moments, are any of the cultural topics that are touched on in the film, political or otherwise, of Mexico in 1971, still true and consistent today? All of the topics that come to light are still true. Politically, there is still oppression against students. The government still hides certain things. There’s still machismo and discrimination. The difference—and the only thing that I miss from that time, and that I wish wasn’t lost—is a person’s ability to be fully present. The scene where the family is sitting together at the dinner table, eating, chatting, fighting. It’s sad because I’ve been to many places around the world, and people are always occupied on their cellphones, and uninterested in getting to know each other and talking in person. Even if it was fighting amongst siblings, people cared about getting to know each other. Play in the rain, etcetera. It’s sad that all of that is lost now—not just in Mexico, but around the world. It’s true. But I think people who invest the 135 minutes in watching the movie might have a switch in perspective. How has working on this movie changed you personally? Well, first, it’s taught me to not give up. That’s the first message I got during filming. Live. Life has its lows and its highs, but never stay where you’re at. Move up. I was captured by the way Alfonso shot the reflection of water from the ground in the first scene, and a shot of the sky in the last. To me, that meant that we have to keep climbing. Fight for what you believe in. Roma will appear in select theaters and on Netflix in December.